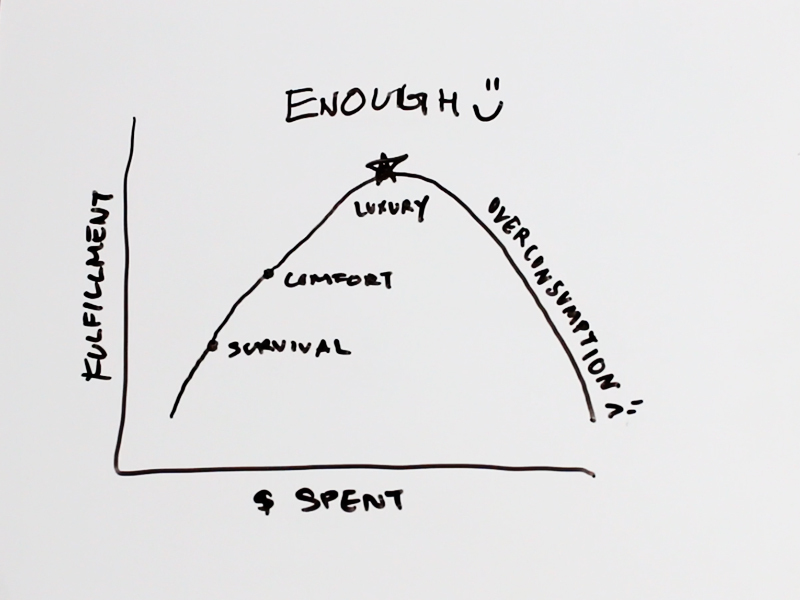 Survival: Many of us start out at a low level of fulfillment and a low level of spending. This is when we start to become self-sufficient and make enough money to purchase basic necessities. 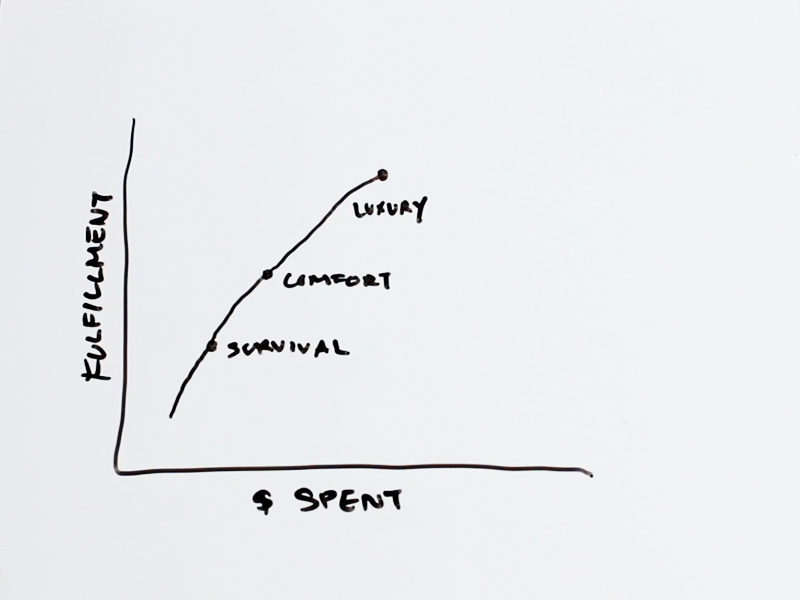 Comfort: As our income becomes to grow, we can afford a few more things that make our lives more comfortable. We derive more fulfillment as we spend more money. Luxury: As we progress in our careers, we start accumulating wealth and perhaps have more disposable income. We can afford a few luxuries. It's important to note that "luxury" does not necessarily mean designer goods (although it can). For some people, "luxury" can be a fancy drink from Starbucks. The point is we have the means to spend a little more to treat ourselves. 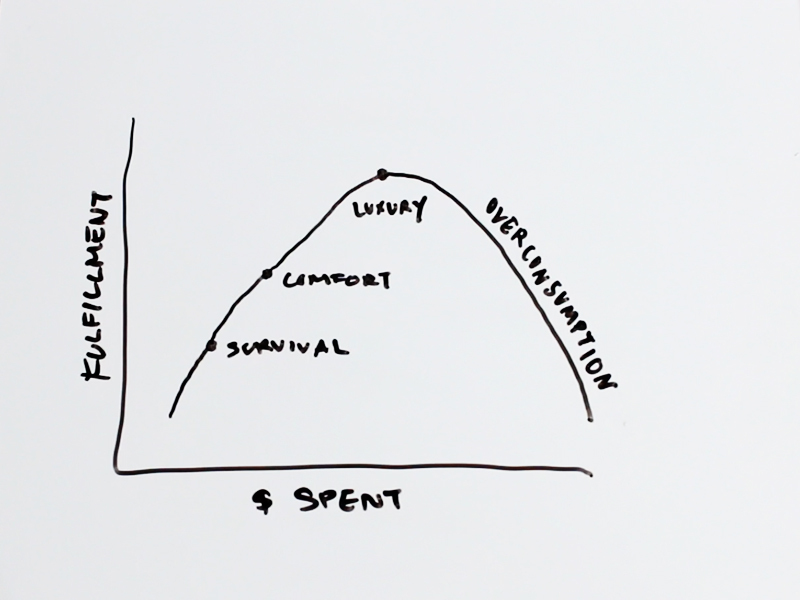 Once we reach a certain point though, spending more money can actually result in decreased fulfillment. There can be a number of reasons for this. Maybe the pursuit of making more money to buy things is resulting in less family or leisure time. Perhaps having more things contributes to clutter and leads to feelings of guilt. 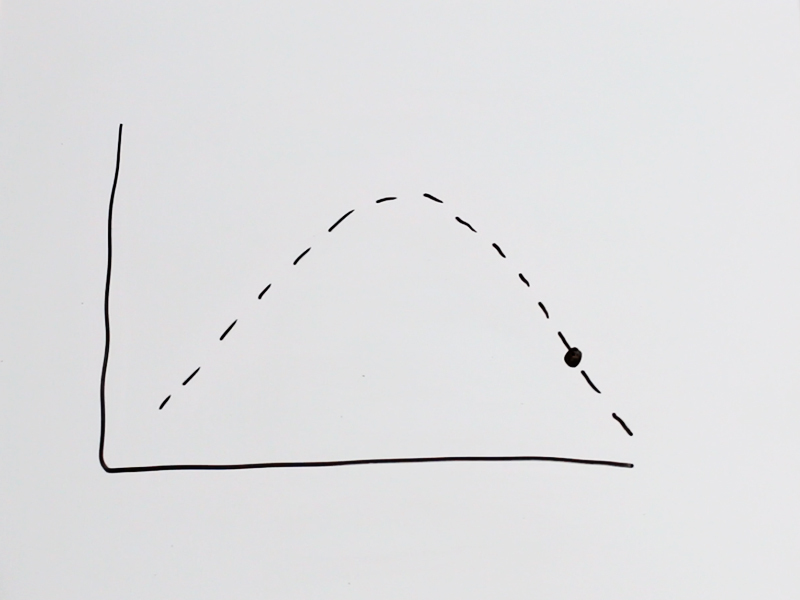 Regardless of the reason, this part of the curve represents overconsumption. The magical place is the point at which you derive maximum fulfillment for the amount of money spent. This point is simply called: ENOUGH. I've been through the fulfillment curve many times for many different categories of things. I started with fashion and accumulated huge bins of clothing, shoes, and handbags. When I reached the overconsumption tail for fashion, I moved on to camera gear. Then to beauty products. And most recently, to a broad category that I'll call experiences that encompasses restaurants, alcohol, events, and travel. As I spent more and more and more, I realized, I'm not longer deriving much fulfillment. In fact, I feel less fulfilled the more I spend. I was at the tail end of the curve, way past my point of enough. For the past few years, I've thought and thought and thought about my money and my life. And sometime in the spring of 2018, I woke up. I crunched the numbers and decided to quit my job. Enough was enough. 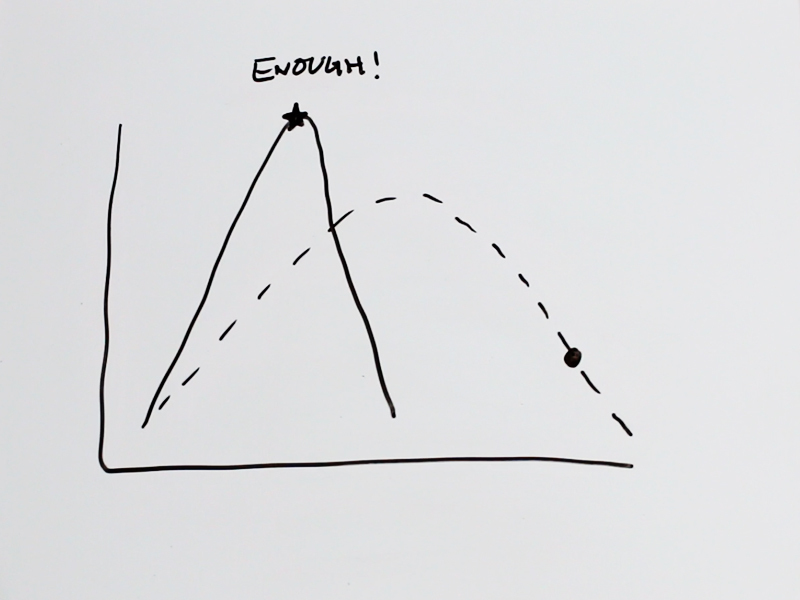 In the 3 short months since I left work, I feel I've been able to shift my fulfillment curve to the left. I'm spending less than I've spent in a decade, yet I feel more fulfilled than ever. I used to reward myself with things that money can buy. Now I reward myself with time to do activities I love. Instead of buying a new handbag, I curl up on the couch with a library book. Instead of going on an expensive trip abroad, I take a walk to meet a friend to check out a museum. Instead of making a reservation to the hottest new restaurant, I cook a nice dinner while listening to a podcast. Instead of working 8 hours a day at a job I don't love to buy things I don't need, I play with Truffle and Lulu. I take an Epsom salt bath. I listen to music. I record a YouTube video. I talk to my husband. It's amazing to be at the point of enough. Who are the people in your life you can't get enough of? What are the things you love about them? I'll be journalling on this at some point today, so please feel free to join me. You can set aside a specific block of time to journal (it could be as little as 5 minutes), or you can add to your journal entry throughout the day each time you feel like buying something. If you don't like journalling, you can just think about the prompt instead of shopping. My former colleague (and friend) shared this question with me as it's a daily practice she implemented in her life. I loved the concept, but I've been off and on about applying it in my daily life, so I thought we could practice together. My twist for this 5-part series is that my answer can't involve shopping. The best thing that happened to me yesterday was spending many hours at home relaxing with hubby, Truffle, and Lulu. So simple, yet so best!